Senior Shannon Rapp, entertainment editor to The Chant, is a three year veteran on staff this year. With an interest in journalist writing, she joined Newspaper to better her writing and photography skills but ended up with a family. Shannon is part of the NC Color Guard. After struggling freshman year to find a place to fit it, she decided to give it a try and ended up falling in love with the activity. She made a connection with the team that she has never found anywhere else at NC. Outside of school Shannon enjoys baking and makeup. She loves baking so much that it has turned into a future career for her. The passion has led her to want to major in Pastry Arts at Johnson and Wales University in Providence, Rhode Island. Her love and desire to live up north comes from knowing that most of her family resides in New York. As an admitted Disney fanatic, Shannon loves to travel to Disney World with her mother, father, and older sister, Kayley, a senior at Berry College this year. Her extreme love for Disney takes origin in watching Disney movies and going to Disney World almost ten times before even turning twelve. Shannon’s favorite Disney princess is Mulan because she loves her fiery, non-patriarchal attitude. A few of Shannon’s favorites include, but are not limited to: Riverdale, peanut butter, and her dog Jack. 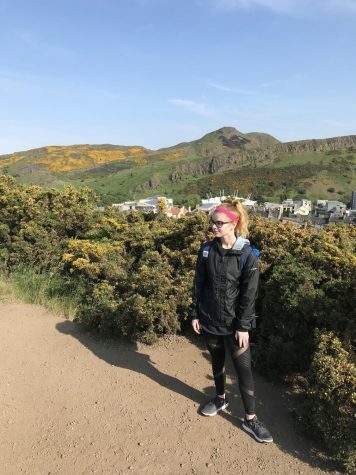 In addition to these favorites, Shannon loves to travel and recently took her first trip out of the country over the Summer to Scotland and England. She hopes to travel to every continent within her lifetime except Antartica because she hates the cold. Although Shannon loves her high school friends and activities, she is most definitely ready to graduate and embrace the next chapter in her life.